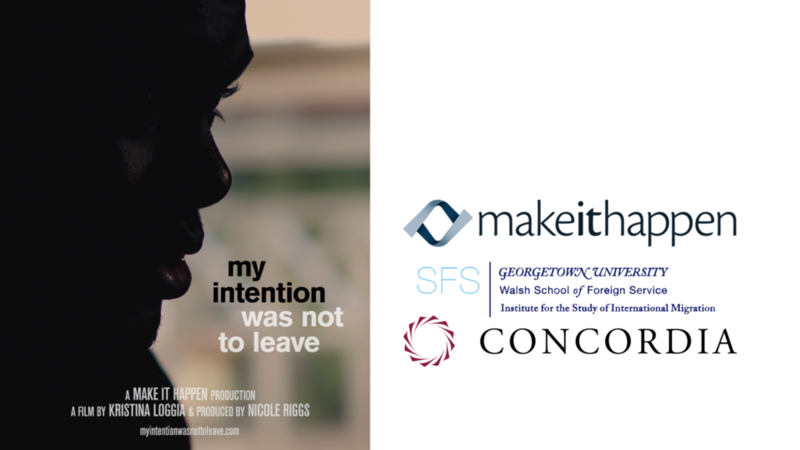 Georgetown University’s Institute for the Study of International Migration (ISIM), Make It Happen, and Concordia are pleased to co-host this special Global Partnerships Week film screening and roundtable discussion. This event will leverage the power of film to catalyze a discussion among the private sector, policy makers, and the donor community about the distinct needs of forcibly displaced adolescents around the globe and how the international response to this often underserved demographic can be improved. Developed to inform diverse audiences of the specific issues facing displaced adolescents, My Intention Was Not To Leave shares the stories of three unaccompanied minor children as they reflect on their treacherous journeys in order to find a better future. The powerful narrative reframes displaced adolescents as children with the resilience and desire to work towards a better future for themselves and their host communities. This event will begin with a screening of the film (20 minutes) and segue into a discussion among issue experts about partnership-based initiatives capable of meaningfully impacting this critical population. This session is designed for partnership practitioners representing the private sector, the U.S. Government, donor institutions, and migrant/refugee community. It is by invitation-only. To express interest, please contact Hanne Dalmut at hdalmut@concordia.net with subject line “My Intention Is”.